After sixteen years living within minutes of Trailview State Park, I finally made it over for a visit this morning. 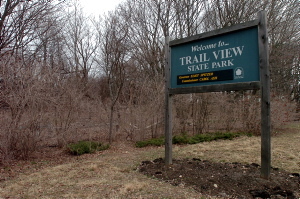 Trailview is actually a series of connected trails that run along a strip that starts just above Bethpage State Park and goes north almost 8 miles to Cold Spring Harbor. The trail is interrupted at points where roads (some major) intersect the route. The section of Trailview that I ran started adjacent to Jericho Turnpike in Woodbury and it connects to Stillwell Woods at the separation of Syosset-Woodbury road. The section I ran wasn't very long but it provided quite a workout. I wanted more of a challenge than I get from my usual Stillwell loop and I sure found it on the Trailview path. After parking in the lot next to the trail head, I chose one of two paths that run north. The trails are only wide enough for a single runner or mountain biker, but two people could walk side by side in a pinch. In fact I encountered a few walkers on my way back and we all managed to make room as we crossed paths. The trails quickly transitioned from flat to rolling, to the point where it seemed like I was either running up or bombing down a steep hill. I did fairly well on the rises and was surprised that I didn't experience major lactic acid burn as I ascended the hills. It was the sharp drops that bothered me most, because the terrain was uneven and full of baseball-sized rocks. I was concerned about taking a tumble a few times. The trail ended at Syosset-Woodbury Road after dropping about 40 feet to street level. I continued across the road and encountered two runners coming out of the woods. I asked them if that was the access point for Stillwell and they said yes. Almost immediately after that, I encountered two mountain bikers. The first one said, "One more behind!" and the other politely thanked me for giving way for him to pass. I only ran about a quarter mile towards Stillwell before turning back. I'd encountered a split in the path and I didn't want to get lost in Stillwell while my car was parked over a mile away at the Trailview lot. I knew that all the downhills I ran on the way over would come back to me as challenging uphills, but I looked forward to the challenge. It seemed as though I covered the return in half the time it took to get to Stilwell. I'm guessing it was because I knew by then what lay in front of me. I wasn't quite at my targeted distance when I reached my starting point so I ran a little longer down the other trail. It was only 3.5 miles but it was a lot of work, not unlike last weekend when I ran through thick snow. It was a good weekend of running and I was pleased to get back on the trail after being away for a few weeks. It's less than two weeks before my next race. I guess I'll need to focus on speed this week and next weekend.